The Kool Skools Recording Project | The music recording & multimedia experience for young people! 2018 Awards Nominations & Award Winners announced. 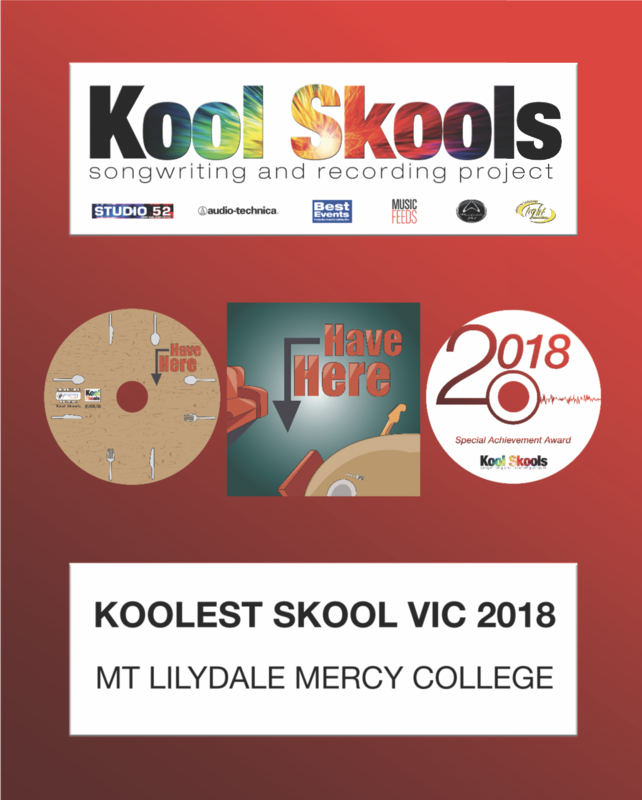 Mount Lilydale Mercy College are the Koolest Skool for 2018 ! The Awards for 2018 have been a great success! 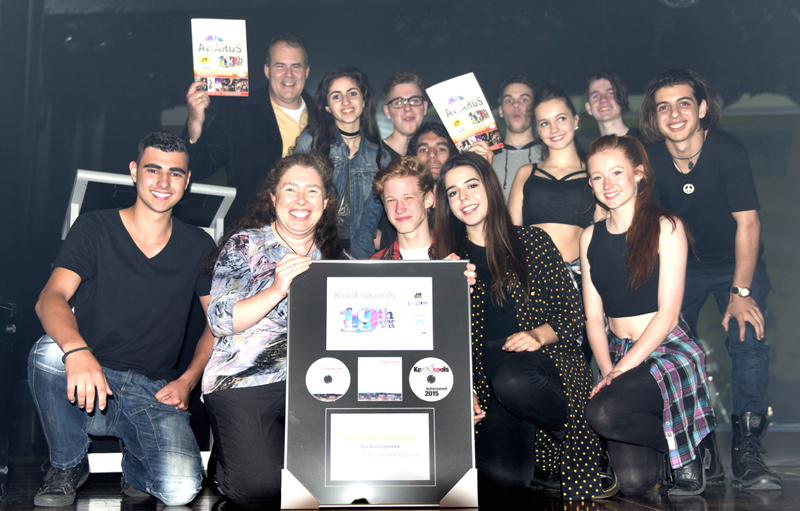 Held at the Thornbury Theatre the show went without a hitch and featured 20 different school age acts performing as part of the showcase chosen from schools from across the whole state. The Koolest Skool was announced at the end of the night as Mount Lilydale Mercy College which is the 2nd time they have received the honour. 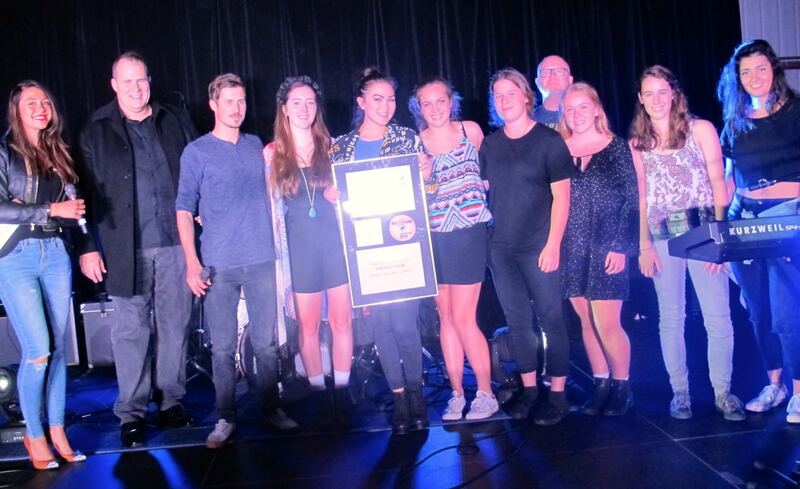 Music Coordinator Denver Carron was there along with a hoard of students from the school to accept the award frame. Checkout all the artists nominated and the award winners listed in the PDF document below. Kool Skools 2018 VIC Awards This Sunday 18th Nov! This Sunday the Kool Skools Awards! We’re celebrating the 22nd year of Kool Skools with a great showcase of the original music from 2018 which is what the Kool Skools Project is all about. The showcase will see some stunning performances that will no doubt inspire, we may even be witnessing the beginnings of some major new careers like in the past when acts Missy Higgins & Delta Goodrem graced the Awards stage before they became household names. Entry is Free! All Kool Skools, Parents, families and students welcome to attend. 2018 shaping up to be a big year for original music! Register Now for the 2017 project and celebrate the 21st Birthday of Kool Skools ! Kool Skools has been running now for a remarkable 21 years and has been a positive experience in countless young people’s lives, helping to start music careers for a lot of acts that are now famous and even house hold names within the Australian musical landscape. 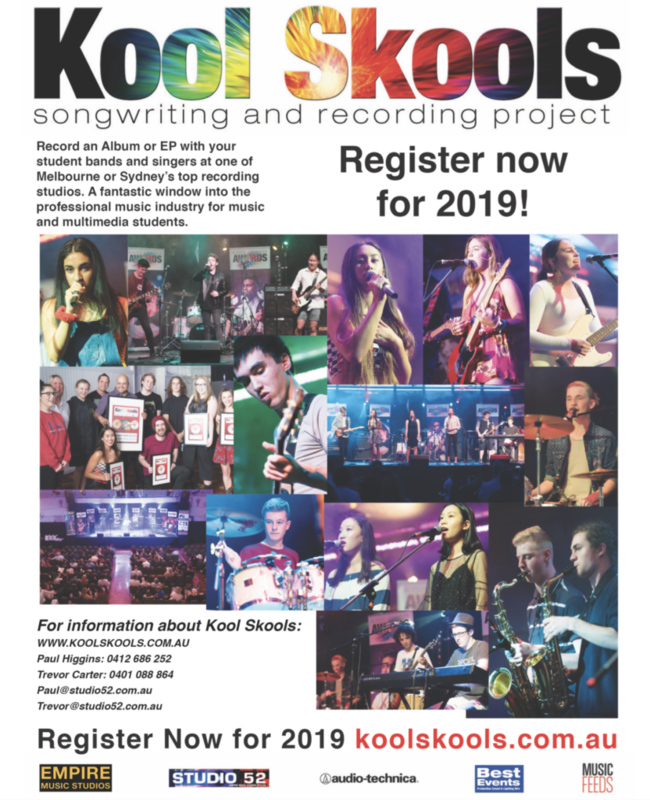 Kool Skools is running again in 2017 at Music Feeds Studios in Sydney and Studio 52 in Melbourne, two of Australia’s best and most professional music studios. This is a fantastic opportunity for young people to learn about the music industry, to be encouraged in the art of song writing and to experience amazing times in a major recording studio dedicated to their own music. Get your school to register now for 2017! To get a feel for the project it’s best to start with the music. Have a listen to a selection of great tracks recorded just last year in 2016 on the Soundcloud link below. Register Now for our 20th year of Youth Music Recordings! 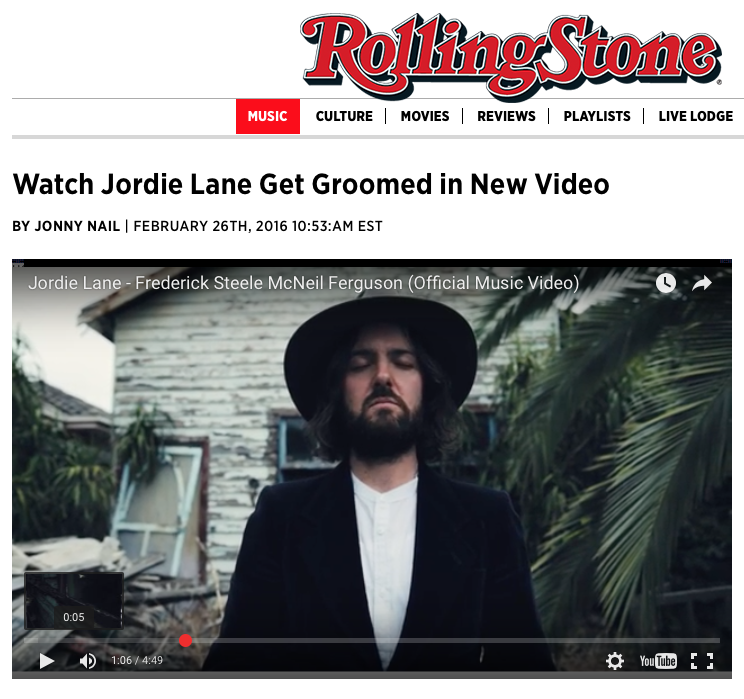 Kool Skools has been a 20 year success story because it is a unique project for youth songwriters, musicians and new media creators. So many young people have gained their start with Studio 52 and Kool Skools which has led to successful and major careers in music, entertainment and the arts. It’s a project available to all secondary level students through their schools, local councils, Freeza groups and youth entities. Register Now for a life changing musical experience and a whole lot of fun in the recording studios! 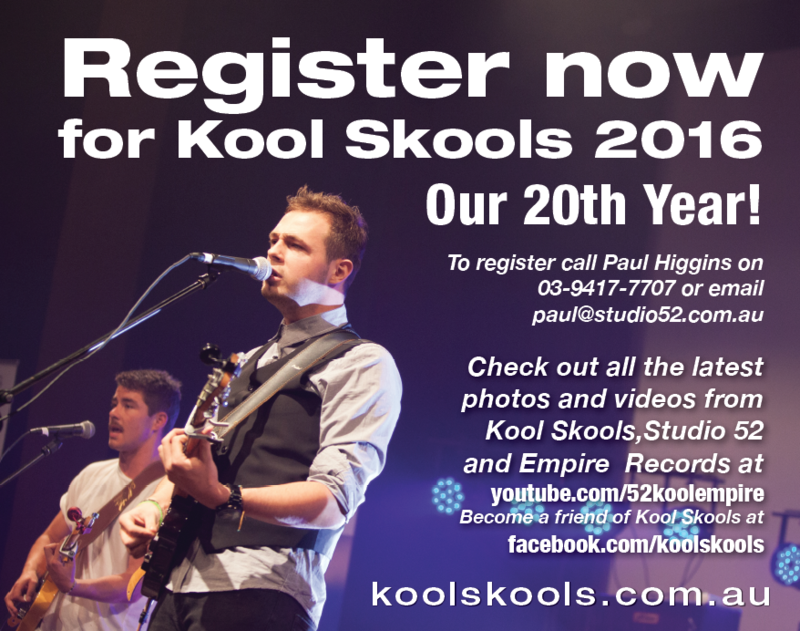 Sign up for Kool Skools 2016 Project, our 20th year!